Great cuckoo dove Reinwardtoena reinwardtsi, photographed by Rob Hutchinson. Contains: Columbigallina, Aplopelia, Leptotila, Zenaida, Geotrygon, Treroninae, Columbina, Patagioenas, Columba, Streptopelia, Stigmatopelia, Macropygia. The Columbidae include the pigeons and doves, a distinctive family of mostly herbivorous, strong-flying birds found worldwide. Earlier authors mostly divided this family between the Treroninae for the palaeotropical fruit pigeons and Columbinae for the remaining 'true pigeons', with a few more small subfamilies for certain distinctive taxa, but this scheme has not been supported by molecular phylogenetic analysis (Shapiro et al. 2002; Jetz et al. 2012). Instead, a clade of New World taxa including the genera Geotrygon (quail-doves), Leptotila and Zenaida (mourning doves) may form one of the basal divisions within the columbids. Its sister-clade, containing the remaining species, is most diverse in the Old World, though it does include the New World ground doves (Claravis, Columbina and related genera). Characters (from Austin 1961): Stout-bodied, neck rather short, head small. Bill short, slender, rounded, usually thickening toward tip and thinner in the middle; nostrils emerging through fleshy cere at base of bill. Plumage a thick, heavy coat of strong-shafted feathers, loosely attached to thin skin so as to drop out easily. Austin, O. L., Jr. 1961. Birds of the World: A survey of the twenty-seven orders and one hundred and fifty-five families. Paul Hamlyn: London. [B66] Bartlett, A. D. 1866. Notes on the breeding of several species of birds in the Society's gardens during the year 1865. Proceedings of the Zoological Society of London 1866: 76–79. [FS55] Felten, H., & J. Steinbacher. 1955. Zur Vogelfauna von El Salvador. Senckenbergiana Biologica 36 (1–2): 9–19. [ME04] Mayr, G., & P. G. P. Ericson. 2004. 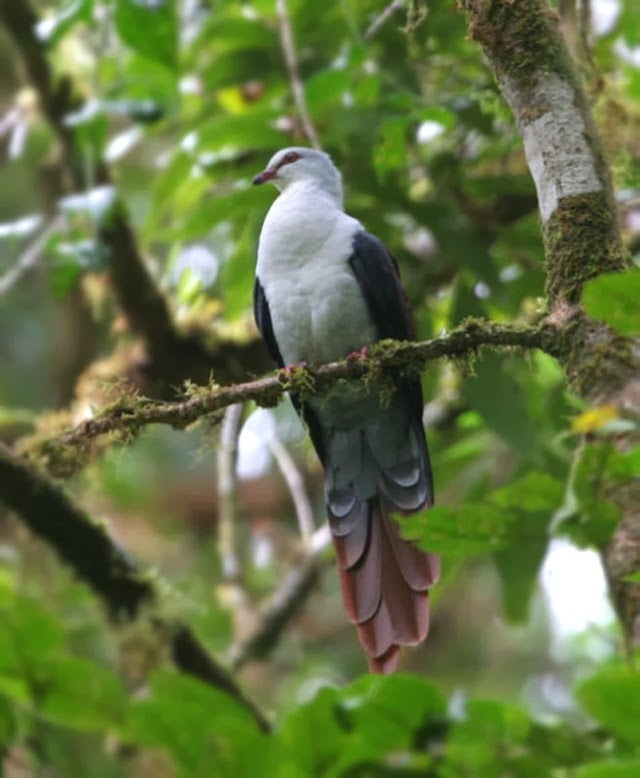 Evidence for a sister group relationship between the Madagascan mesites (Mesitornithidae) and the cuckoos (Cuculidae). Senckenbergiana Biologica 84 (1–2): 1–17. [M03] Morcombe, M. 2003. Field Guide to Australian Birds 2nd ed. Steve Parish Publishing. [S66] Schlegel, H. 1866. Communication from, on mammals and birds collected in Madagascar. Proceedings of the Zoological Society of London 1866: 419–426. [SS02] Shapiro, B., D. Sibthorpe, A. Rambaut, J. Austin, G. M. Wragg, O. R. P. Bininda-Emonds, P. L. M. Lee & A. Cooper. 2002. Flight of the dodo. Nature 295: 1683. [S18] Stone, W. 1918. Birds of the Panama Canal Zone, with special reference to a collection made by Mr. Lindsey L. Jewel. Proceedings of the Academy of Natural Sciences of Philadelphia 70: 239–280. [T62] Tendeiro, J. 1962. Estudos sobre malófagos: Revisão monográfica do género Columbicola Ewing (Ischnocera, Philopteridae). Memórias da Junta de Investigações do Ultramar, ser. 2, 32: 7–460.